I'll try to keep this short and sweet today, as I have a head cold and my brain feels like it's wrapped in layers of cotton wool. 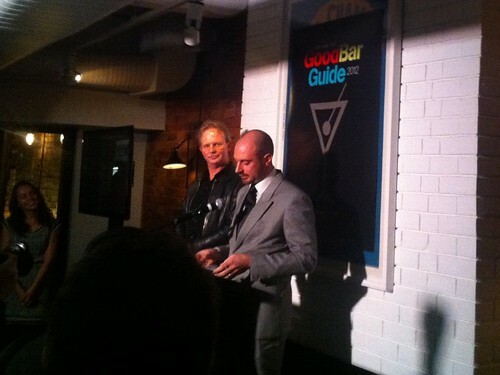 I'm one of the contributing reviewers in the inaugural edition of The Age Good Bar Guide (2012) and on Monday night I went along to the awards night and launch. 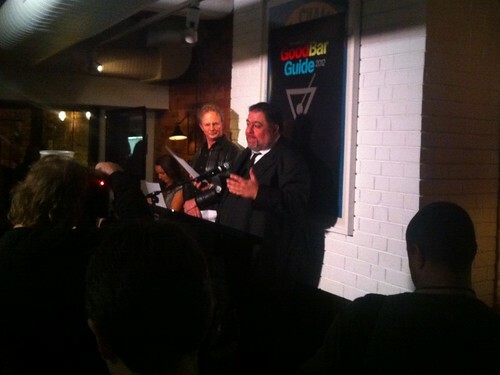 Pictured below is Michael Madrusan from The Everleigh accepting the award for Bar of the Year, and Mario Di Ienno accepting the award inducting Gerald's Bar into the AGBG Hall of Fame (other award winners listed here). The Guide is a handy pocket-sized volume that goes onsale tomorrow, June 9: you can get a copy from your local newsagent, $9.95 or $5 with tomorrow's Age - clip the coupon if you get your paper delivered. There's also an iPhone app due out in a few weeks. You know what else happens tomorrow? WORLD GIN DAY! Get a martini in you. 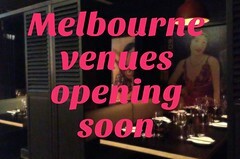 There are over 80 events on in June as part of the Melbourne Food & Wine Festival's Roast Collection. 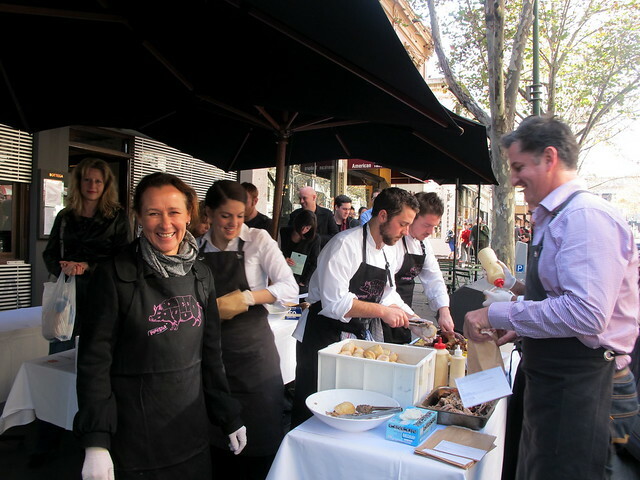 Pictured below is Judy Crough from Western Plains Pork: she helped kick off the Collection at Bottega, handing out free roast pork rolls to Bourke Street passersby. A list of all the Roast Collection events can be found here. I'm booked in to take a friend to Embrasse's Farm Barn Restaurant next week (tickets still available I think): apparently we'll be sitting on hay bales! My friend Burger Mary is teaming up with the Red River BBQ boys to set up a permanent BBQ residency every Wednesday night at The Workers Club in Fitzroy, dishing up Americana meat treats like sliced brisket sandwiches ($15), pulled pork sandwickes ($14), crispy fried chicken wings smothered in habanero hot sauce ($8, pictured below) and weekly Texan specials. 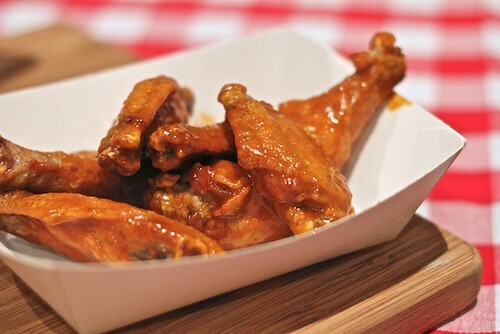 Every Wednesday from 6pm to 10pm or until they run out, full details here. It was Hannah's birthday last weekend, and a group of us celebrated with a long lazy lunch at The Commoner. I'd never gotten around to eating there before, but holy hell was the food good. 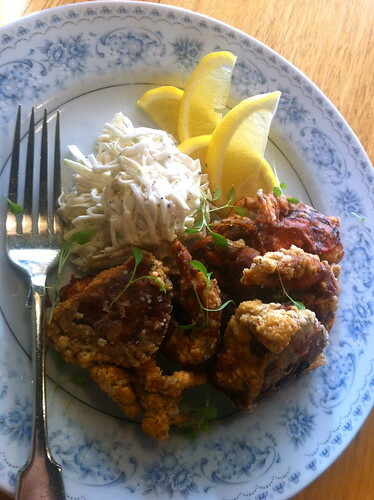 This was the fried soft shell crab with celeriac remoulade and lemon (usually served as part of a $16 entree with shoestring fries). 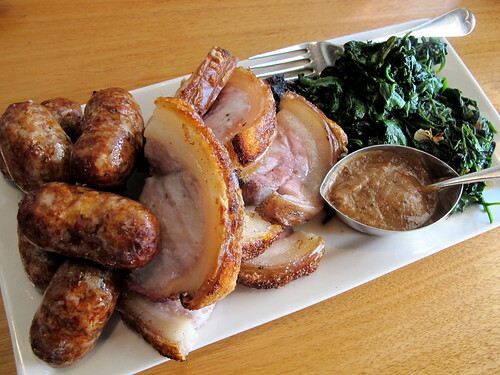 The other highlights: the omfg Berkshire pork belly, fennel and cider sausages (made in-house, natch), cavolo nero and shallot puree ($32 for a regular sized main, we were having it as part of a special banquet menu). 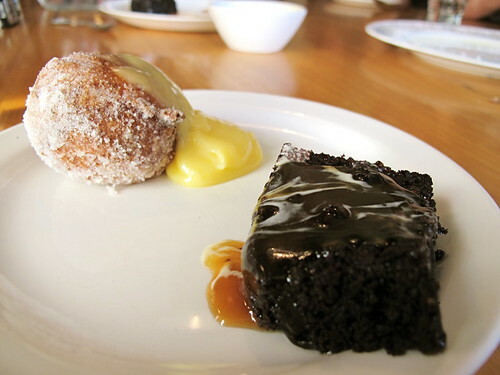 For dessert, we shared a plate of beignets with lemon sherbet and lemon verbena curd ($4 each) and brown ale pudding with salted caramel and cream ($13 for a regular serve). HIGHLY RECOMMENDED. And to finish off this round-up's pics, some food shots from the family lunch we had the previous weekend. It was a special occasion for us as it would have been my Nonno's 91st birthday, so we held a fancy Italian lunch in his honour. My aunt Paola made a superb "risotto rosso" with radicchio, pancetta, red onion, red wine and balsamic (recipe hopefully coming soon on her blog Italy on my Mind). 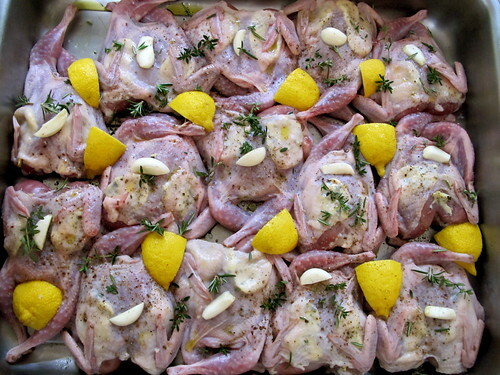 The quails about to go in the oven. 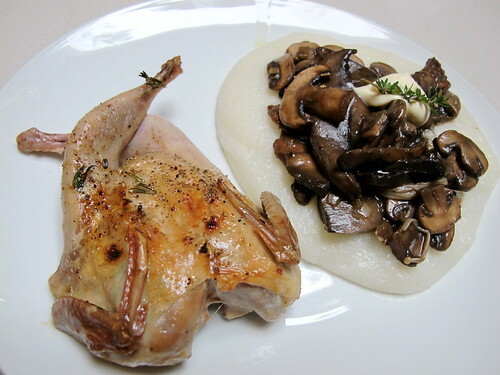 The roasted quail and wild mushroom ragu using the mushrooms above, served with mascarpone and white polenta (adapted from an old Karen Martini recipe). 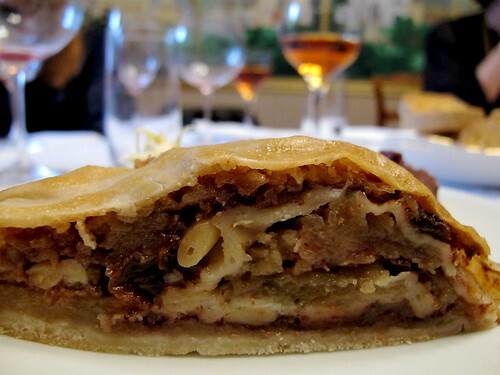 For dessert Nonna made her special apple strudel (recipe now on Paola's blog! 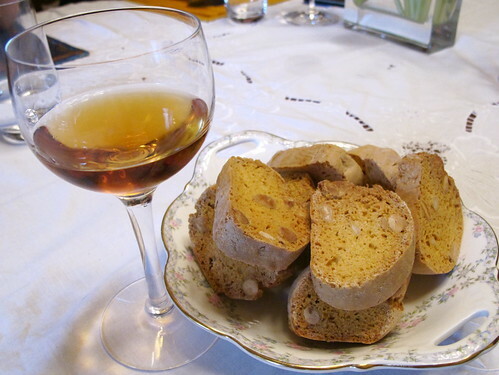 ), and we also nibbled on cantucci (traditional Tuscan biscuits) dipped in Vin Santo. - Remember that photo of the fish post-it note art mural in Meyers Place that I included in my last fortnightly round-up? Here's a nice little blog post about the making of the mural. - The lovely Roshena, former Melbourne food blogger and MTR radio food reviewer, has just returned from a trip overseas (three months living in New York and several weeks jetsetting through places like Spain and Italy). Her blog The Trip is filled with pretty photos of idyllic destinations, but the page you'll most want to bookmark is the fantastic New York City Guide: 60+ reviews of the latest and best places to eat, drink and see in NYC. - "Many natural winemakers are simply making bad wine, and if they think they're revealing the terroir, they're deluding themselves." Huon Hooke gets inflammatory about natural wines. - Stunning artistic photos of food in extreme close-up. - US chefs and a blogger on the topic of guests taking photos of food in restaurants. As Jane commented on Twitter, a lot has changed over the last two years. 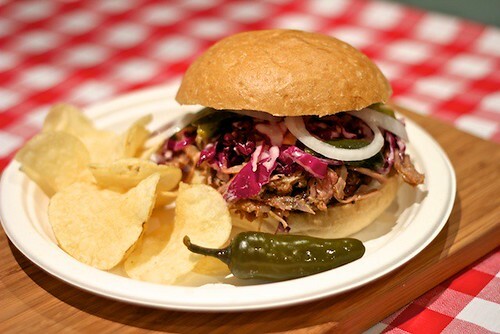 - The Great GoogaMooga and elitism: what Brooklyn's food festival says about foodies. - Jay Rayner on why people prefer reading bad reviews to good reviews. - I must confess to being a little freaked out by the sound of the 'laksa sorbet' Celeste had recently in Adelaide. - The Guardian's Sejal Sukhadwala on the bogus quest for 'authentic' food. Related: is it fair for chefs to cook other cultures' food? Sample quote: "Then, to have these CIA grads come through, repackage the food, and sell it back to me at a premium is just ludicrous. You made fun of us until we were embarrassed about our food and changed our menus to appease your HORRIBLE taste in shrimp with lobster sauce, now your kid grows up and wants to tell ME what Chinese food is because Bear Stearns sent him to Shanghai for six months?" - Loved this blog post about Prinzessinnengarten, a not-for-profit organic community garden in Berlin's Kreuzberg district that is also fully mobile. Check out the second-last photo of the garden being transported! There is such thing as World Gin Day? My faith in humanity is restored. So what exactly is white polenta? I'm assuming it's made from white maize?? 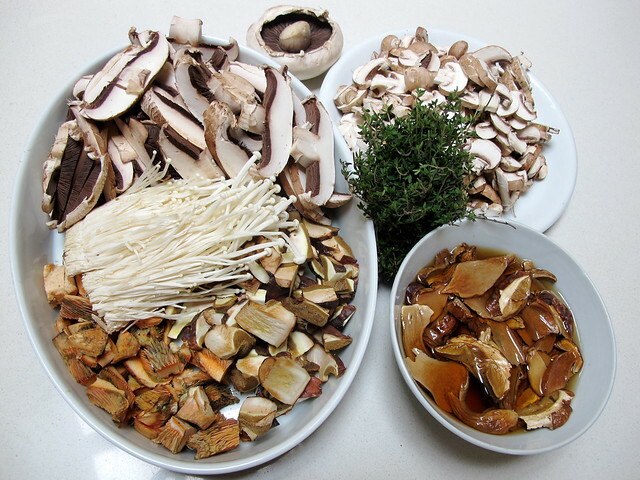 It looks quite lovely under those mushrooms. Speaking of which, did you see that another person has died from eating foraged death cap mushrooms? I think that makes it three for this year. Very sobering for wild mushroom hunters like me - and something we could all do with a bit more education on. Thanks for the blog loving! Tamsin - pretty sure white polenta is actually the same thing as grits. Whether they're instant or not is the only other real difference to the prep, i believe. But either way - YUM! 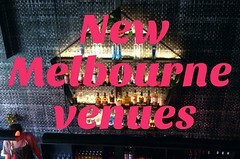 Hi Claire, have just come across your blog via Milkbarmag and i'm in love! 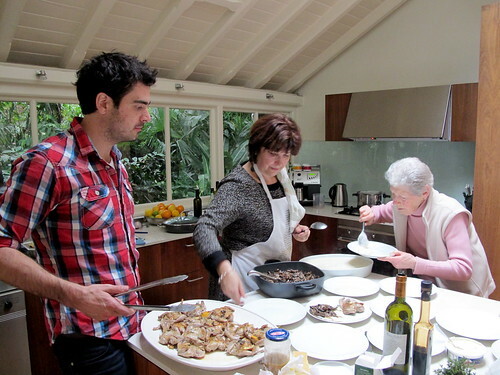 Wish I had my own Italian family too!